As part of its jazz-funk series, SoulMusic Records is proud to reissue the group’s first two LPs for the label, 1976’s self-titled set and the follow-up, 1977’s “Sky Islands” in this two-on-one CD. RE-PRESS: CD ORIGINALLY RELEASED IN 2013 . 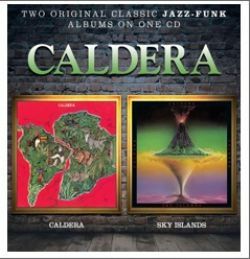 Originally formed in the mid-‘70s in Los Angeles, the jazz-fusion band Caldera made four albums for Capitol Records between 1976 and 1979. As part of its jazz-funk series, SoulMusic Records is proud to reissue the group’s first two LPs for the label, 1976’s self-titled set and the follow-up, 1977’s “Sky Islands” in this two-on-one CD. The brainchild of guitarist Jorge Strunz, the nucleus of the band included Eduardo Del Barrio (keyboards); Steve Tavaglione (sax); Mike “Baiano” Azevedo (percussion); Carlos Vega (drums); and Dean Cortez (bass). The album “Caldera” (which featured the US R&B-charted single, ‘Out Of The Blue’) was produced by former member of The Crusaders, Wayne Henderson and featured primarily compositions by Strunz and Del Barrio. The group’s acclaimed second set, “Sky Islands” was produced by Del Barrio, Strunz and Earth, Wind & Fire keyboardist Larry Dunn (in his first outside production). In addition to Dunn as a musical guest, the album also featured a then-unknown Dianne Reeves on the title track (which she co-wrote with Dunn) and the much-revered standout cut, ‘Ancient Source.’ The LP achieved US chart status and has since become a classic among jazz-fusion and jazz-funk fans worldwide. Illuminating notes by renowned US writer A. Scott Galloway include extensive quotes from Jorge Strunz, Eduardo Del Barrio, Wayne Henderson and Larry Dunn among others.